I have always had a weak spot when it comes to garnets. It probably started when I was very young and my mother told me that her birthstone was garnet. Back then, what came to mind as a garnet was a dark red gem. Years later when I started collecting gemstones and learning more about them, I found out about the wonderfully green variety that was called "tsavorite". Tsavorite garnets put most of the emeralds I had seen to shame. They were such a wonderful sparkling green! So being biased to Christmas colors by virtue of my birth, how could I not fall in love with a gem that was outstanding in those shades? 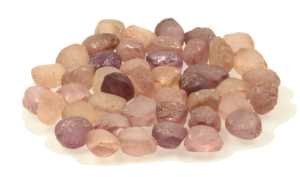 As I furthered my gemstone studies with the GIA Colored Stones course, I learned that garnets came in other shades ranging from a purple red to orange to yellow to green and some were even colorless. Then I started faceting and discovered that garnets proved to be cooperative in developing a nice polish. Plus many of the reddish types in modest sizes were quite affordable for a beginner faceter's budget. Occasionally a flaw or "feature" of the crystal would become a problem by ending up where it would cause mischief. More often, I could see included crystals and needles when inspecting under magnification while I was polishing the stone, but these inclusions would not be visible to the unaided eye in the finished gem. There were basically two problems with garnets. 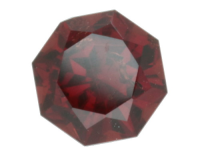 The first was that the larger red garnets often were too dark to sparkle. They just sat there looking red. Not awful, but not as exciting as one might hope. The other was a budgetary one. Rough for tsavorite and other types which would sparkle even when large was quite expensive. Thus my accumulation of garnet rough has tended towards smaller sizes in the darker reddish shades and fewer, even smaller pieces of the lighter colors. A few months ago a parcel of Mahenge garnet rough followed me home. These garnets tend to be nicely shaped, fairly clean pieces that run from a light peach to a nice medium raspberry shade. When cut and polished, these stones are wonderfully bright. 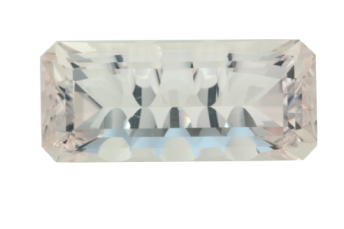 Most of the parcel is smaller sizes -- .5 to 1 carat finished. This launched me into an effort to work through a lot of the smaller garnet rough I still had from many years ago as well as working on the Mahenge parcel. Once the small rough is properly dopped the process of cutting it is usually low stress. The smaller the facets, the quicker it is to cut and polish them. (The flip side of that is a slight loss of attention can yield a significant error given the scale of things.) The bottom line is that the majority of the stones I have cut recently have been garnets. And lots more to come. So why not try the approach on some slightly larger stones? The original green beryl was under 5 mm. wide. I wanted to see the result in a stone that was in the range of 8 to 10 mm. wide. 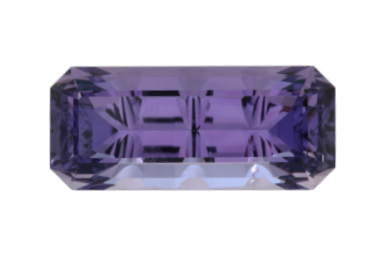 In searching through the rough I had on hand, I found a few pieces that met the desired width, but would end up with the length more like two times the width rather than the four times of the green beryl. At least for the initial experiments, that would have to do. The idea was to test some variations on a theme. 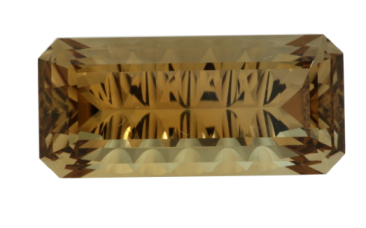 Take a basic long emerald cut and add concave facets to the pavilion only. The crown would be a standard step cut so the only thing being considered was the impact of the concave facets on the pavilion. I expected that one of the combinations above would clearly be better than the others. But so far, I have not been able to pick a favorite. Meanwhile, I have acquired a few pieces of rough which have a length to width ratio of 3. So some rainy day, I will get around to the next step in this series. Stay tuned.